Passing white or pale colored stool is a sign that something is not right with your biliary system. The biliary system is composed of the organs and ducts that produce, store and transport bile. Issues with your gallbladder, bile ducts, pancreas, or liver can cause your poop to turn a clay or pale color. Stool can turn from its usual brown color to a whitish-gray or light gray if there is not enough bile in your digestive system. Other medical conditions like viral infections, digestive problems, or a parasite infection can also cause pale colored poop. This is because they can affect your digestion and cause a lack of bile in stool (acholic stool). If you have noticed that on occasion your poop is pale or white colored, there may be nothing to worry about. However if you start having frequent white bowel movements, then it is time to see your doctor. What is White or Pale Colored Stool? There is a lot you can tell about your health by the color of your stool and its consistency. White or pale colored stool means that something is affecting the flow of digestive bile. Sometimes infants and toddlers can pass whitish poop if they are born with constricted bile ducts. Because having clay-colored stool can mean that you have a digestive issue, you will usually have other symptoms. In fact, sometimes these symptoms can appear before you start passing white feces. Right-sided abdominal pain in your upper abdomen where your liver and gallbladder are located. Is Light Colored Stool a Cause for Concern? Yes. The normal color of stool should be light to dark brown, and white poop is not considered normal. 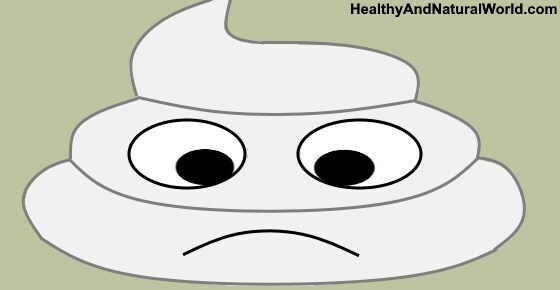 Let’s look in more detail at many of the reasons why you could be passing white or gray poop. Inflammation of the pancreas can affect your biliary system and be one of the causes of pale stool. Hepatitis is a disease that affects the liver and any form of hepatitis can cause you to pass chalky stool. There are various forms of hepatitis that are known to cause clay-colored poop. These are viral hepatitis, hepatitis A, hepatitis B, hepatitis C, and alcoholic hepatitis. To help care for the health of your liver, it’s important to avoid dangerous habits that can ruin your liver. You should also keep yourself well-hydrated to help flush toxins from your digestive system. Your poop could be white because of an issue with your gallbladder and its function. Let’s look at some gallbladder disorders that could be to blame for pooping pale stool. For many of the gallbladder-related causes of white bowel movements, please see my articles on how to treat a gallbladder attack. If you have your gallbladder removed, then my article about the best diet after gallbladder removal has information you will find useful. Gallstones are a common reason for white stool in adults when they block any of your biliary ducts. You can try to get rid of some gallstones by drinking apple juice and apple cider vinegar. This can help to flush gallstones from your gallbladder naturally. In severe cases of gallstones, doctors may recommend surgery to remove them. Another symptom of a gallbladder problem that can cause white poop in humans is an obstruction in your biliary duct. As well as gallstones causing a biliary obstruction, a blocked bile duct can be caused by inflammation of the bile ducts, cysts in the bile duct, or enlarged lymph nodes. Inflammation of your gallbladder can be caused by a number of issues and it can make your poop turn grayish white. The symptoms of cholecystitis include passing light-colored stool and having intense, sharp pain in your upper right abdomen. Narrowing of your biliary ducts can restrict the flow of digestive juices and be one of the causes of passing white stool. Not all causes of white poop are connected to liver disease, your gallbladder, or pancreas. In some cases, light-colored bowel movements are a complication of other conditions. Clay-like stool can by a complication of viral diarrhea or gastroenteritis. Infections of your gut can cause very unpleasant digestive problems, like passing clay-colored diarrhea. To help relieve the symptoms of gastroenteritis (stomach flu), you can try making this anti-inflammatory ginger tea. Ginger can help to soothe your digestion and help recover quicker from digestive upset. An infection caused by the Epstein-Barr virus (EBV, or infectious mononucleosis) can be one of the reasons why you have started passing white feces. One reason that your poop is gray is if you have a blood disorder called sickle cell anemia. This condition results in your red blood cells having a “sickle” or crescent shape. Passing white chalky stool could mean that you have an abnormal immune reaction to gluten. Most people with celiac disease have severe digestive upset if they consume grains like wheat, barley, and rye. If you have started passing clay-colored stool and have bouts of clay-colored diarrhea, it could mean that you have a parasite infection of your intestines. Parasites like tapeworms, roundworms, threadworms, or pinworms can cause a number of unpleasant symptoms. Please read my article to find out how to get rid of an intestinal parasite infection naturally. Passing white stool doesn’t always mean that you have an underlying medical condition. In some cases, medications can temporarily cause your poop to be almost white. For ways of getting rid of diarrhea naturally, please see my article on the best home remedies for diarrhea. Can Cancer Cause White Colored Stool? Some types of cancer can cause chalky stool if they affect any of the organs in your biliary system. Some tumors in the upper right abdomen can also press on bile ducts and cause an obstruction. These types of tumors can also turn poop whitish-gray. The best way of preventing acholic stools is to keep your digestive system healthy. The major cause of passing white poop is due to conditions connected with your biliary and digestive system. Rather, you should try to eat a healthy, well-balanced diet that is low in cholesterol and high in fiber. Treating white poop depends on the underlying cause. If you start passing light-colored stools regularly, your doctor may order certain tests to check liver function and your digestion. If you suffer from malabsorption, then changing your diet or taking certain vitamin supplements can help to treat clay-colored stool. If bile ducts are blocked or you have bile strictures, then your doctor may arrange for surgery to cure light-colored or white stool. Surgery will help to restore the proper flow of bile to your small intestine.